I flew to Morocco from London – a short cheap flight – but almost immediately it felt like I had arrived in a whole new world. It was my first trip to North Africa since I started writing this blog and I had been looking forward to seeing this part of the world. Marrakech was overwhelming at first. Within minutes I was lost in Marrakech’s medina and the sounds and smells enveloped me. When I finally found my accommodation I tried to make up for my lack of planning and put together a list of what I wanted to see in the city before I had to move on (unfortunately it was a short trip of less than two weeks). There is far too much to see in Marrakech on any one trip, I quickly decided. But I wanted to get a sense of the place and see the major sights on this trip. I told myself I would always be able to come back. In the end, I was very pleased I managed to see most of the best things in Marrakech. There was even time to relax a little and eat plenty of the great Moroccan food. The places I have listed below are all worth putting on the list if you’re planning a trip to Marrakech. I easily did them in two days but you could probably squeeze it all into just one day if you really wanted. Of course, there are many other things to explore as well and I am the first to admit that these suggestions are all very obvious. Surprisingly, though, not a single one of them was overly busy with foreigners. There’s something nice about Marrakech that, although it is a popular holiday destination, it rarely feels artificial or touristy. 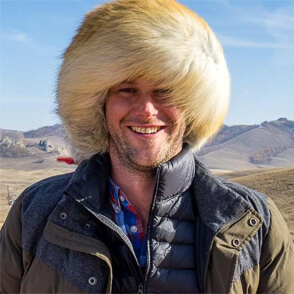 If you have been yourself and have any other suggestions, I would love to hear about them in the comments below. 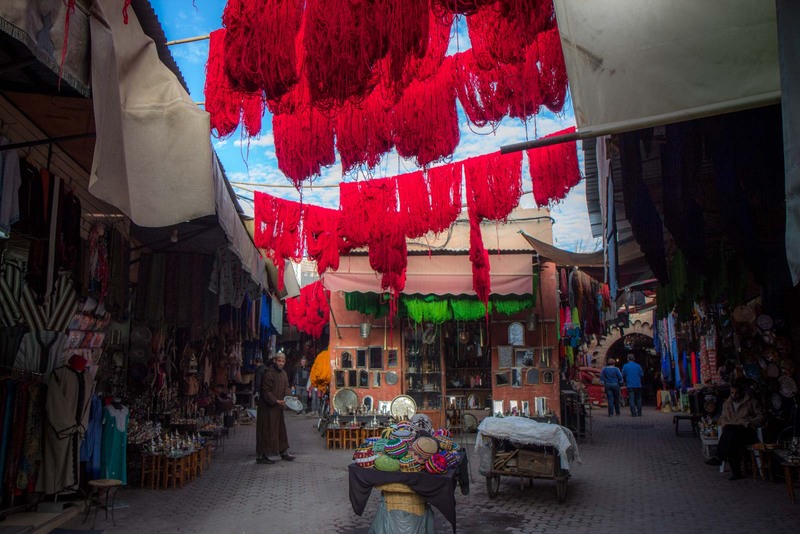 But, in the meantime, here are some tips on the best things to see in Marrakech. El Bahia is a beautiful palace built in the late 19th century. The top artists of the city were employed to decorate it and they spent more than ten years putting together the stunning mosaics and gardens that you can see today. You aren’t able to walk through the whole palace because much of it is still being used but it takes at least half an hour to wander through the public route. Make sure you take the time to look at it from every angle – in some of the rooms it’s the ceilings which are the most magnificent. The nearby El Badi Palace has definitely seen better days. It was built in the 16th century and must have once been a grand and opulent palace with an enormous courtyard and pool in the centre of it. These days it’s in ruins and it’s just storks who live there, making their nests on the roofs of the buildings around the edges. It doesn’t take too long to see everything here because… well… because there’s not a whole lot to see. But it is still worth the visit just to appreciate the scale and imagine what it must have once been like. 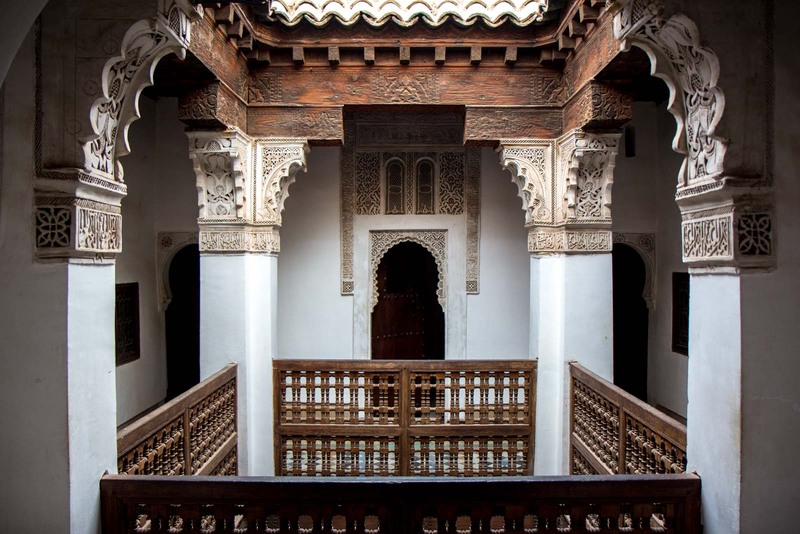 The Saadian tombs are more than 400 years old but weren’t discovered until 1917. 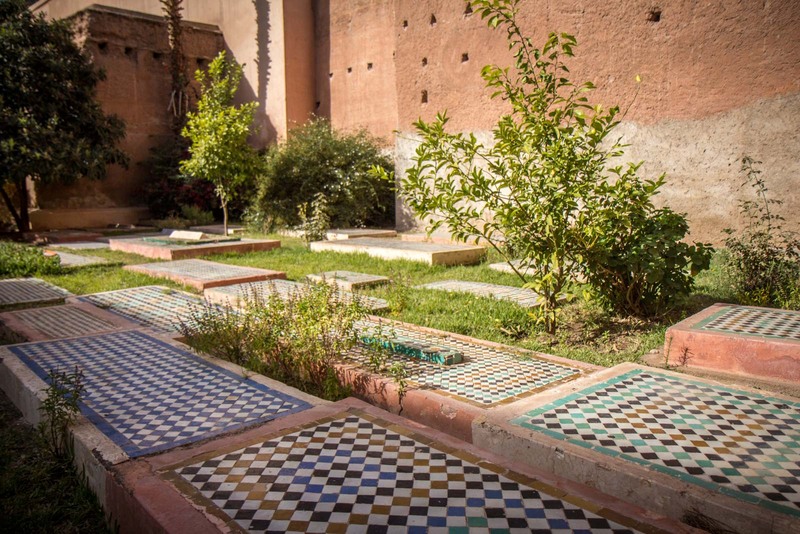 They hold the graves of about 60 of the Saadi dynasty that ruled Morocco from 1554 to 1659. There is nothing overly grand about these tombs but each has been intricately decorated with beautiful and traditional styles of the era. Although the space holding them all is quite small, you can take your time to appreciate each of the tombs. 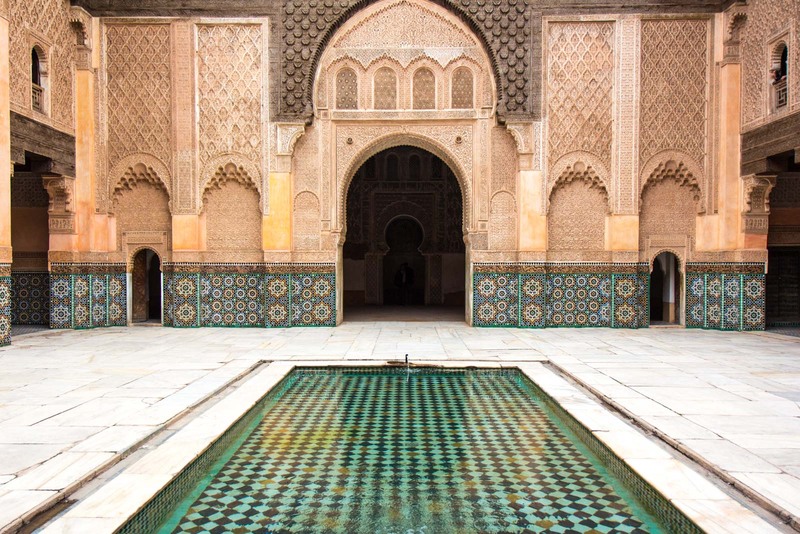 The mosaic artwork in the main courtyard of Ben Youssef Madrassa is some of the best looking you will find in Marrakech. The Islamic college was built in the 16th century and was one of the largest in northern Africa, housing up to 900 students. It wasn’t closed until 1960 and is now open to the public as a historical site. On the lower level are the more impressive ceremonial areas while the second floor gives you a glimpse into the studious life of the young people who have lived here over the centuries. 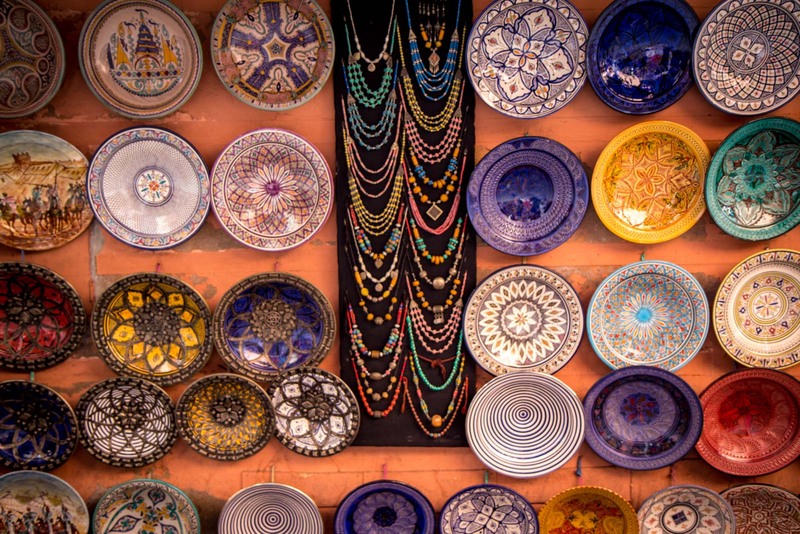 The souks of Marrakech (or markets) are a highlight of the city and they are hard to miss. There are plenty of souvenirs to pick up here – some for a bargain and some with questionable quality. But it’s also fascinating to walk through and see the hustle and bustle of the city’s traditional trade. Many parts of the souks are dedicated to particular industries. Make sure you find the clothes-dying section for some stunning colourful photos. You can see some more of my photos of the souks of Marrakech here. I have to confess I am conflicted about recommending a visit to the tanneries but I’ve included it in this list nonetheless. Right on the far edge of the medina are these pits where animal hides are turned into leather. The whole area smells pretty awful and the locals working here have tough unenviable jobs. It should seem like an interesting part of the city to have a quick peek at but I feel the large number of tourists who go there actually treat a legitimate industry like a sideshow. You are also certain to be harassed by people offering you ‘tours’ and when you decline they’ll become quite aggressive. If you do visit, try to have a thick skin (no pun intended) to deal with the smell, the emotions, and the harassment. 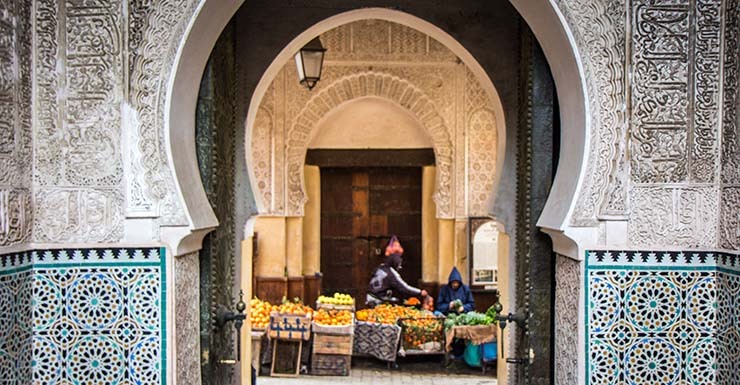 This is the centre of Marrakech’s old town and is often referred to just as “the big square”. 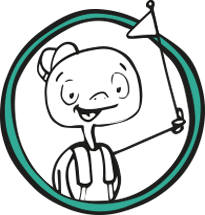 It is very large and convenient to use for your own orientation if you get lost. During the day it is full of buskers – although not everything is pleasant. The caged monkeys and snake charmers are best avoided. It still has a festival-like buzz in parts, though. At night it comes alive even more with scores of food stalls and even more street entertainment. It’s a fun place and you should spend at least part of one evening there. Be careful if you choose to eat, though. The pop-up restaurants will try to overcharge you if you don’t ask for prices upfront and act confidently. Ahh Marrakech, this has been – well Morocco in general – one of the places I have to see. Not sure why exactly, it’s just one of THOSE places my mind has made a you-must-go-there place. I don’t think that i’d visit the tanneries though, not our of moral opposition, just that I already know what a tennery smells like and I can do well with never smelling it again, hah. I think it’s a “must-go-there” place for a lot of people and, having had a brief taste, I can see why. I think it’s because it is just so different to all those European countries that are so close. As I said, like a whole other world – but one that’s quite easy to get to and travel in. With the food, the weather, the colours, the tradition… everything… there’s something quite magical about it. Excellent and very helpful post with beautiful pictures! I only made it to Tangier and Chefchaouen when I was in Morocco. I really want to go back though and explore more of the country. Maybe I’ll have the chance this next year since I’ll be living in Spain. Great tips! I hope everyone reads down and sees these as well! There are definitely a lot more things to do than just the one’s I’ve mentioned. I think the ones I’ve included are a good introdution but then, if you have time, it’s worth exploring further away. I went into the newer parts of town and wasn’t overly impressed… but I’m sure there are some bits and pieces to find there. Beautiful photos! I loved the Bahia Palace and also the Majorelle Gardens, although I didn’t make it there until my 2nd trip as it was a bit out of the way. It sounds like the Majorelle Gardens have got a bit of support from people here. Let’s add that to the list… I’ll try to get there if I end up back in Marrakech sometime soon! Excellent blog with interactive map! 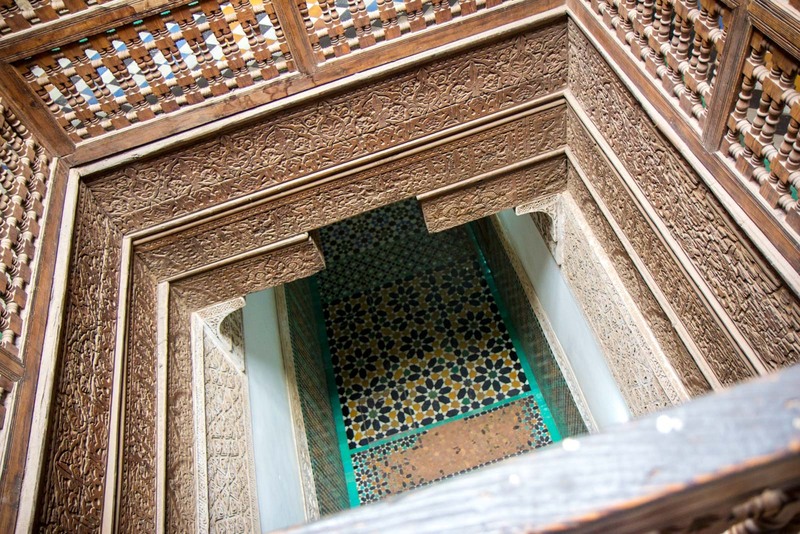 I loved Ben Youssef Madrassa with its extensive geometric patterns. They are mind blowing! Not keen on “the big square” Always feel tired after a visit. Amazing pictures… Michael… Morocco is one of my dream destinations… maybe someday I’ll get to visit this country. Beautiful images! They remind me to re visit Morocco. I’ve been to Morocco a couple of times now and could easily go back. There is so much to see and being there for the atmosphere is just as much fun as seeing the sites. It’s pretty cheap and easy to get to from much of Europe too! Great post! Morocco is truly a magical place! Been a few times and will be going back this year on a photo tour! Thanks so much, I’m so glad you like it!! Morocco is such a charming place! I want to go back soon and visit the Sahara Desert and the well-known “blue city”! Hurrahhhh I love Morocco and wish to go there with my family for spending holidays.